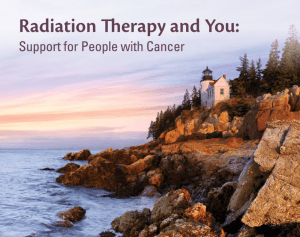 This booklet provides facts about radiation therapy and side effects and describes how patients can care for themselves during and after treatment. Focuses on how patients can manage their side effects, symptoms to watch out for, and communicating with the health care team. therapy for cancer. People who are close to you may also find this booklet helpful. such as what radiation therapy is and how it affects cancer cells. depending on the part of your body being treated, and ways you can manage them. nurse, and others involved in your treatment and care. does not apply to you.